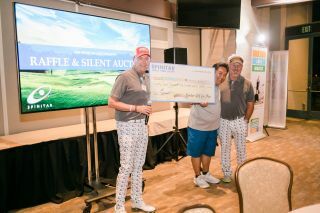 Last week, Spinitar guests and sponsors raised more than $87,000 for City of Hope, a cancer treatment and research center located in Southern California, at the fourth annual Spinitar Golf for Hope charity event. The sold out event took place in the heart of Orange County at Tustin Ranch Golf Course on Thursday, November 8, 2018. Each year Spinitar brings together AV industry partners, customers, family, and friends in the effort to raise awareness for those who suffer from cancer, diabetes, and other serious diseases. Guests who attended the event experienced a day's worth of golf, friendly competitions, raffle prizes, silent auction opportunities, awards, dinner, and a reception. This year’s special guest speaker was City of Hope Leukemia survivor, Alex Tung, who shared his experience of what it was like to go from a healthy, happy and active Southern California native to learning he only had six months to live. Alex Tung (center) spoke about his City of Hope experience at the 2018 Golf for Hope event. Over the past four years, Spinitar has raised more than $300,000 for City of Hope, all of which has gone directly to the non-profit organization. “We are very proud to be able to support City of Hope for the fourth year in a row. We are thrilled that so many Spinitar industry partners, customers, and employees share in our interest to be a part of supporting such a great cause,” said Spinitar principal, Jeff Irvin. Also in attendance this year was celebrity guest, Andy Buckley, who is best known for his role as David Wallace on the American comedy series, The Office. Being a true supporter of City of Hope, Buckley addressed the crowd and thanked everyone for their support and participation. This was Buckley’s second year in attendance at ‘Golf for Hope’. This year’s platinum sponsors included, Crestron, Legrand AV, and Planar Systems. Gold sponsors included, Allied Steel, Harman, and Sharp. The hole-in-one sponsor was Rusnak Land Rover of Anaheim Hills.